The club was awarded the First Place Achievement award - Gold Division, and we were also named an International Distinguished Club, both of these for the first time in our club’s 45-year history! Finally, Cindy Lam was named a Robert F. Lucas Distinguished Lieutenant Governor, and was also awarded a $1000 district scholarship. At the District Elections, Kaitlin Cirillo was endorsed by the NJ District to run for Key Club International Vice-President at International Convention in July. Our students represented Parsippany Hills in the best way possible, and your advisors are very proud of all of you! Congratulations! Parsippany Hills High School has earned the College Board's AP® Computer Science Female Diversity Award for attaining female student representation in AP Computer Science Principles for 2018. This award has been given to only 685 of the 18,000 secondary schools worldwide that offer AP courses. This honor acknowledges the amazing work that PHHS is doing to engage more female students in computer science for the high-paying, in-demand jobs of the future, and opportunities to help solve some of society's most challenging problems. NCTE (National Council of Teachers of English) for its 2018 magazine. The Parsippany Hills High School Academic Decathlon (AcDec) Team participated in the New Jersey Region III Competition on Saturday, February 2 at Woodrow Wilson Middle School in Clifton. The team of seven members and six alternates placed third in the region and third for the Super Quiz. Team members who participated were: Cavin Anbuselvam, Tyler Gurth, Amy Liu, Matthieu Granvil, Brandon Ng, Dhruv Patel, and Shoumik Vaddi. Alternate team members who participated were: Schenia Alvarez, Shantel Alvarez, Hyun-Jung Kim, Mann Pandya, Aarnav Patel, and Victor Wang. 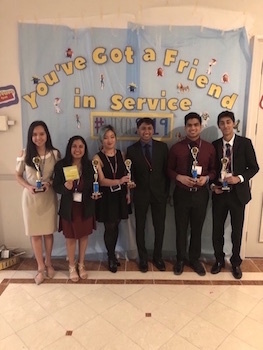 Overall, the Parsippany Hills High School team took home almost 40 individual awards and honors for the regional competition. Congratulations to Chipwrecked Vikings who placed 7th overall and participated in the semi finals of their very first meet as a team! Siddharth Swaminathan, Tyler Lee, Aditya Patur, Sweta Desai and Samay Desay all worked very hard on their robot and engineering notebook. Congratulation to two PHHS Choir members on earning a chance to perform with the All Nationals Honors Choir this November. Only ten students were chosen to participate from New Jersey: Ruth Kowalski and Kaneesha Vaz - will represent the excellent ParHills Music Department. They will work with nationally acclaimed Directors and Professors for their performance in Disney World. For more information, follow the link! : https://nafme.org/programs/all-national-honor-ensembles/"